At last! Tuesday brought some warm sunshine! And time to enjoy it and make good use of it! As you know, I have been threatening some far reaching changes for some time now. Last week, the 25 year old ash tree, was finally felled, leaving a stump – and a mushroom! Along with that, the garden reshuffle has moved on from the “thinking about it” phase, to the “getting on with it” phase. So the warm, sunshine made for a perfect day to make some progress. 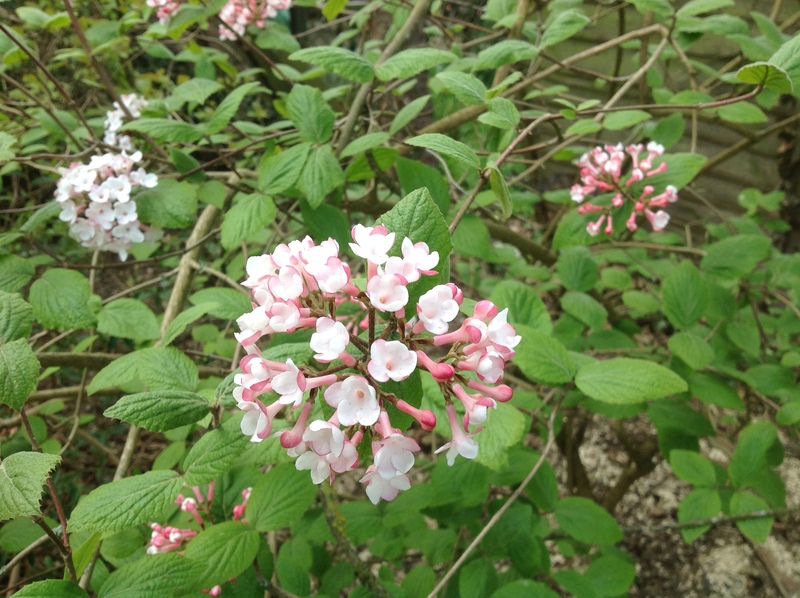 It wasn’t just the sunshine that made the hard slog such a pleasant experience, but also the adjacent Viburnum carlesii “Aurora” pumping out its perfume. The beautiful pink domes of flowers are quite plentiful this year, and so the scent of pinks kept wafting my way. 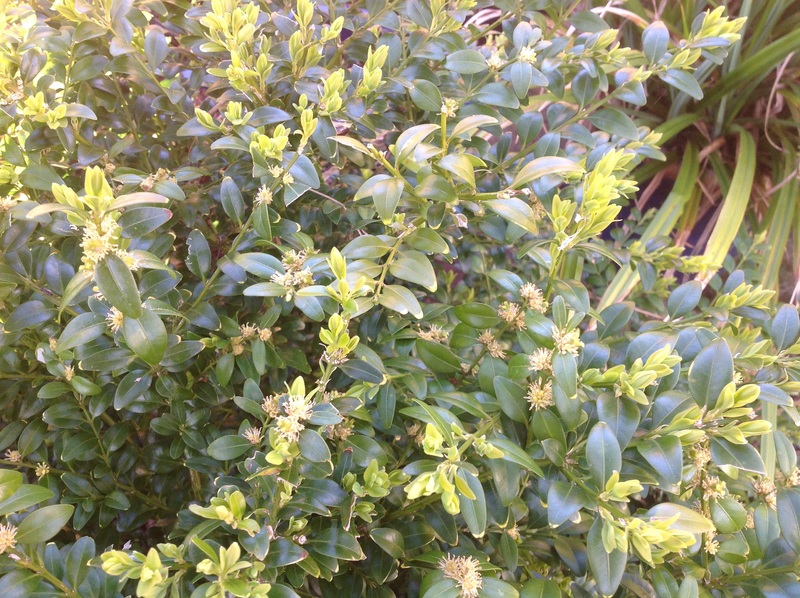 And while trudging up and down the garden, passing the Osmanthus delavayii rewarded me with another perfumed delight – this time more heady, like jasmine. The tiny, pure white trumpets, en masse, create a stunning effect against the dark green leaves. So I was distracted, and found myself, armed with my iPad, on a perfume hunt round the garden. 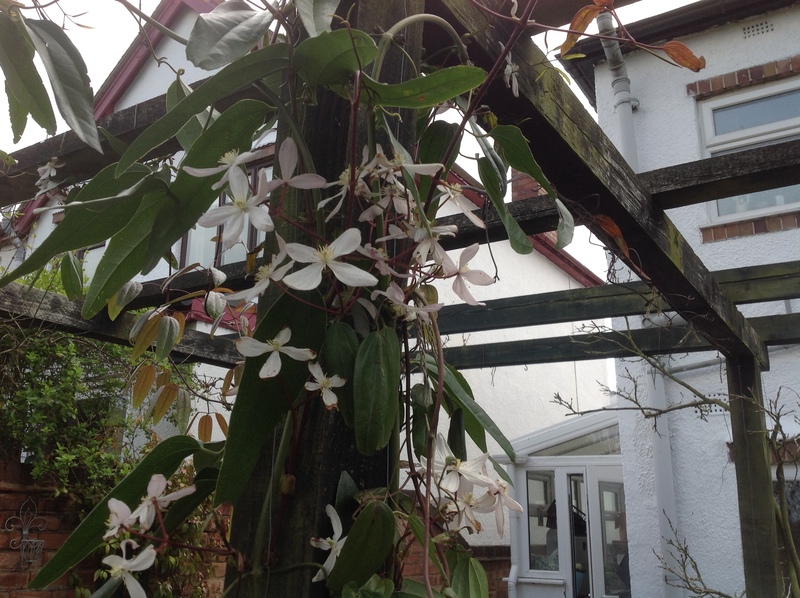 Clematis armandii, which had opened its first buds shortly after we returned after New Year, has now reached its peak and is starting to go over. Its new shoots are waving around, threateningly, daring me to tie them in. Their soft perfume can be detected quite unexpectedly. 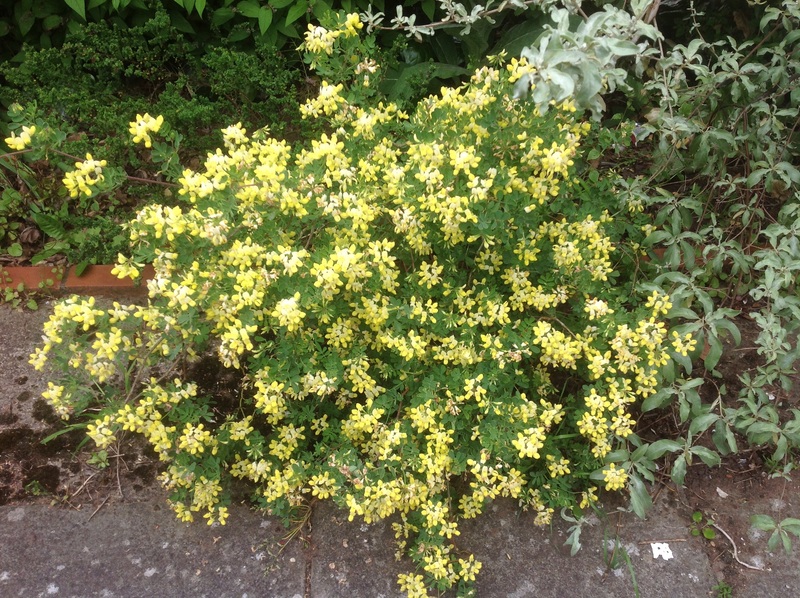 Of course, true to form, the Coronilla in the front garden, was still blooming away happily. Such a pretty sight, with the lemon flowers set against its glaucous leaves. Here’s one I moved earlier! 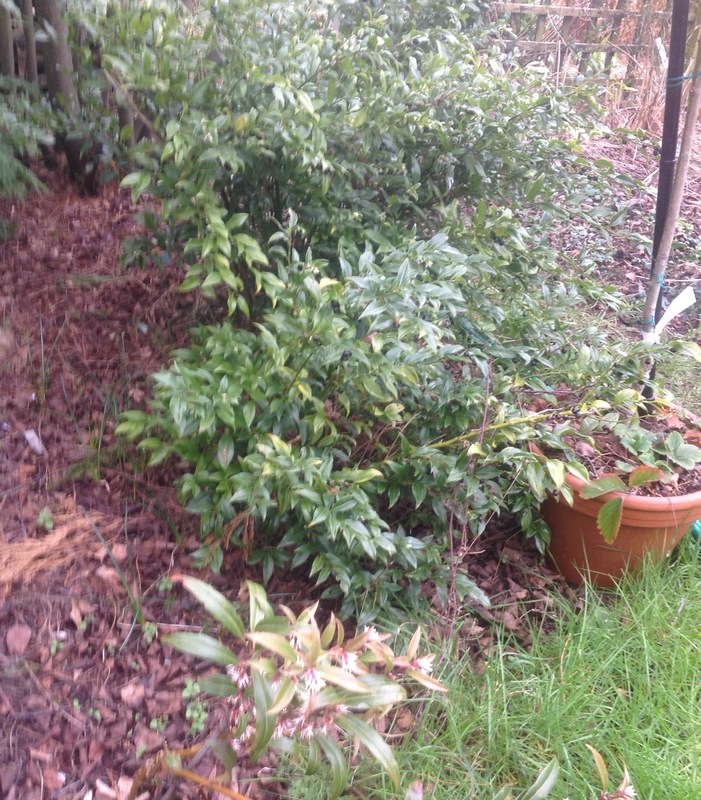 Elaeagnus umbellata was a victim of my reshuffle, moving from its cramped position snuggled up against a Philadelphus in the Scented Shrub border. Here, its delicate form will mingle with the perennials in what was originally the Medicinal herb bed, and its silvery leaves should provide a lovely backdrop to the bright pink blooms of Rosa gallica oficinallis (the “Apothecary’s rose”). 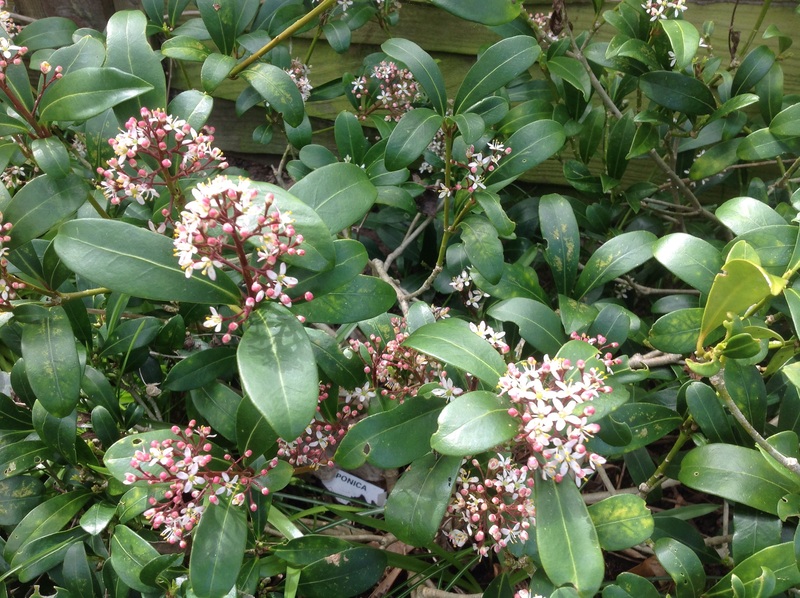 Its tiny, powerfully scented flowers can still be spotted in the photo. And smelt in the garden! So, as you can imagine, I didn’t achieve as much as I’d set out to do, but who cares! 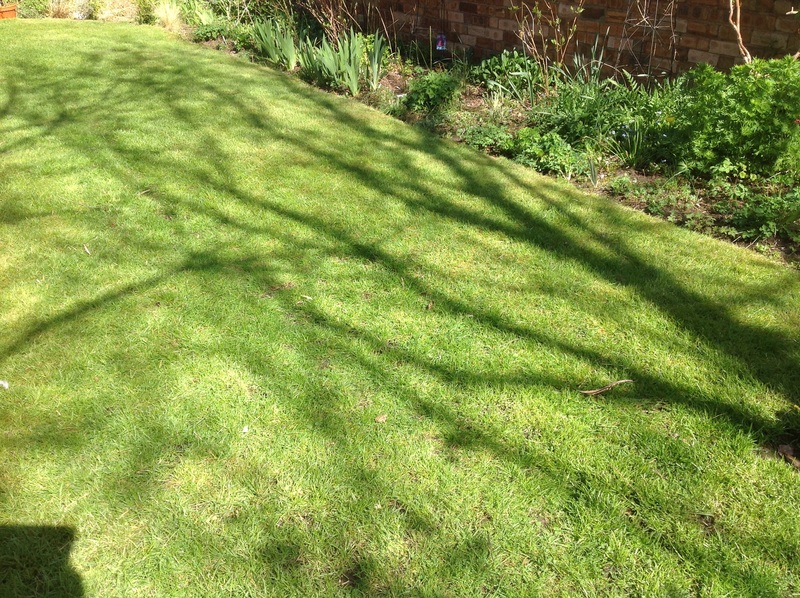 That’s what’s important about gardening – taking time to enjoy it, as well as to do it! 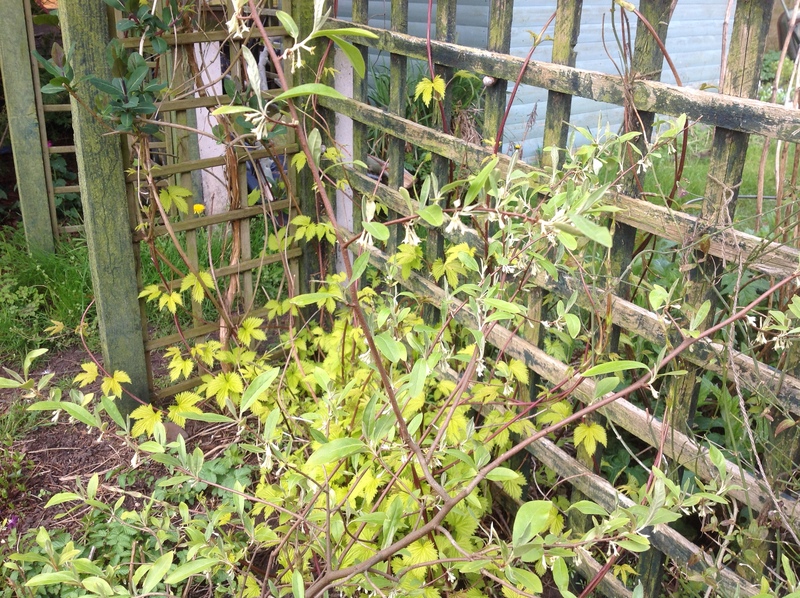 This entry was posted in The Scented Path and tagged Clematis armandii, Coronilla, Elaeagnus, Garden scent, Roses, Scented shrubs, Viburnum on April 24, 2016 by thelonggardenpath. My Poor Little Homeless Babies! Poor little things! It’s not as if they’re unloved – far from it! Just one look, and I had to have them. And that’s the problem. The family is growing and must have a home. Escallonia “Iveyi”, Salvia “Senation Deep Rose”, Drimys lanceolata, Caryopteris clandonensis “Dark Knight”, Helwingia chinensis, Cestrum parqui, Pittosporum tobira, with a tiny hellebore seedling at the front. Things appear uneventful on The Long Garden Path over recent weeks, with not much to report or write about, other than broken fence panels, which is of little interest to anyone. Activity levels outside have been far too low, with either the wind or incessant rain beating me, sending me scurrying indoors to the welcome warmth. There have been some pleasures on the “walks round the estate”. and the early spring beauty in the Woodland. But the little grey cells have not hibernated. Indeed, they are working well, if nothing else is. They have long been pondering the problem. And so, now, there is an overhaul in the pipeline. I think I’ve already mentioned tweeking the cottage border and adding in or moving, scented shrubs, which, hopefully will do better in a sunnier border. And now the “walks” have clarified where each will live. Of course, this mental exercise has had a knock on effect, which will impinge on both the existing shrub border, and the Woodland. Will I ever resist moving my poor plants about and let them be? The little grey cells have also pondered the Allotment, and improvements that can be made there. They have persuaded us to add two new raised beds – one for veg. and another one for more strawberries. You can never have too many strawberries! Oh, but before I get carried away with excitement, I just have to go back to the aforementioned fence panels. None of this can sensibly be done till they are repaired! Such is a gardener’s life! 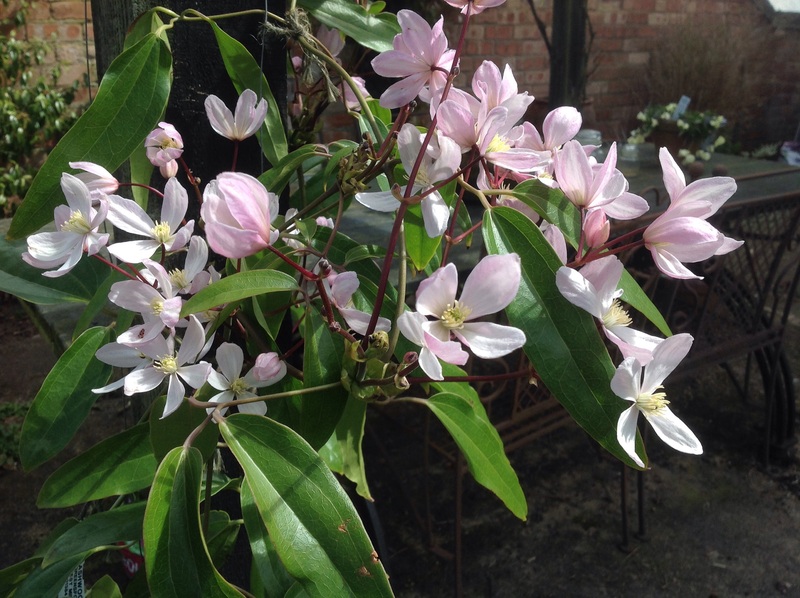 This entry was posted in The Scented Path and tagged Clematis armandii, sarcococca, Scented shrubs on March 8, 2016 by thelonggardenpath. You may or may not know, that we have enjoyed a wonderful ten days in Bath, celebrating Christmas and New Year – not to mention my birthday! And look what we came back to! A few surprises! I’m not talking about collapsed fences or garden devastation, which would have been expected, considering the awful conditions that so many people, unfortunately, have had to endure over Christmas. Yes, we did have one panel that had decided it couldn’t stand up to it anymore. No, I’m talking about the very springlike changes that had happened in our absence. 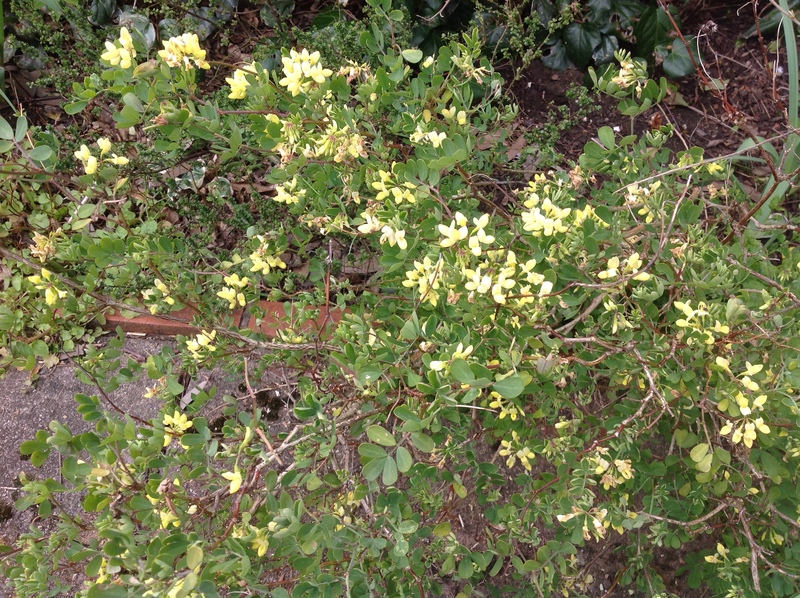 I had left behind our Coronilla blooming in perfumed splendour, and expected (or at least hoped) to come back to our scented, winter-flowering shrubs coming into bloom, which they either have, or are about to. 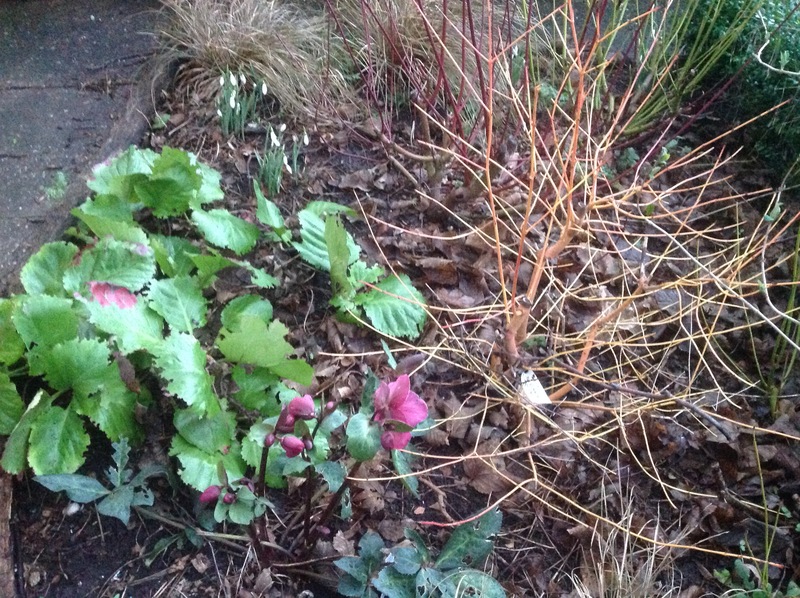 I was expecting to come back to seeing our newest hellebore, Hellebore “Anna’s Red” in full flower, as the buds had just started poking through the soil in the middle of December. To me that seemed early for hellebores, which normally don’t flower here till January at the earliest. I bought this beauty in full flower, last February. These gorgeous red blooms have been joined by our first snowdrops, Galanthus “S. Arnott”, all enhanced by the coloured stems of our dogwoods. A pretty picture! 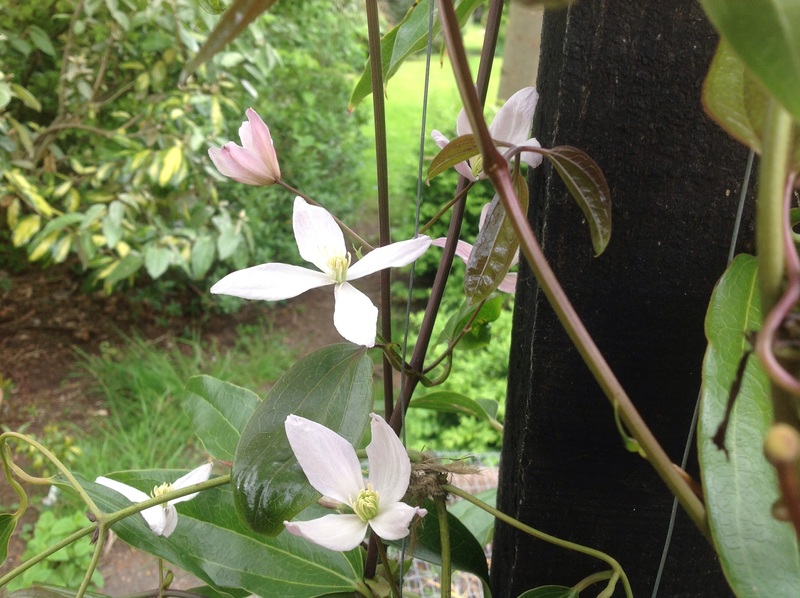 I wasn’t expecting to come back to see our Clematis armandii flowering. Although the buds had been developing well before we left, I still didn’t expect them to flower until March or April – certainly not 5 days into the the New Year, in what should be the depths of winter. Granted, not the best photo. Quite by surprise, I noticed the flowers from the kitchen window, when the light was fading. I’ve lightened it as best as I can. At the same time, one of the new shoots I’d photographed before we left, was now halfway across the path! Must tie that in asap! 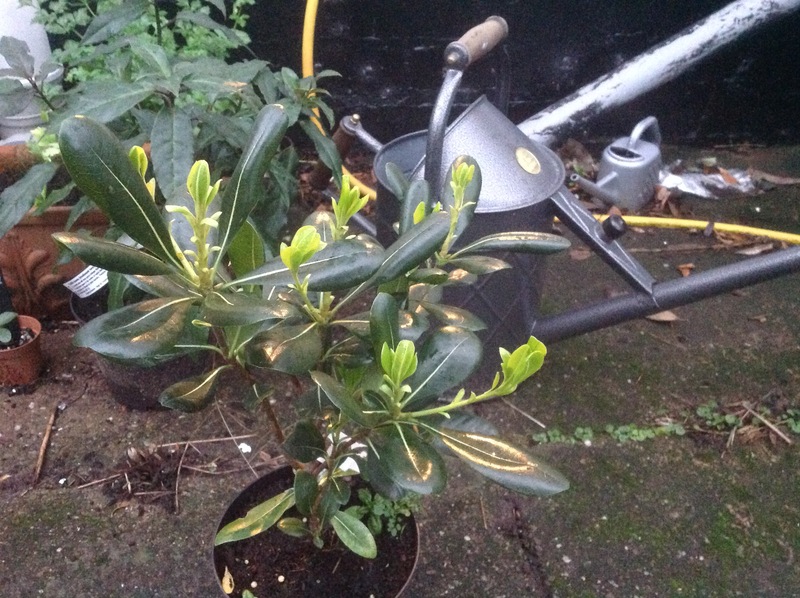 I couldn’t believe all the fresh new growth on a Pittosporum tobira, sitting by the back door, waiting to be planted. Which just begs the question, what does Spring “proper” have to offer? 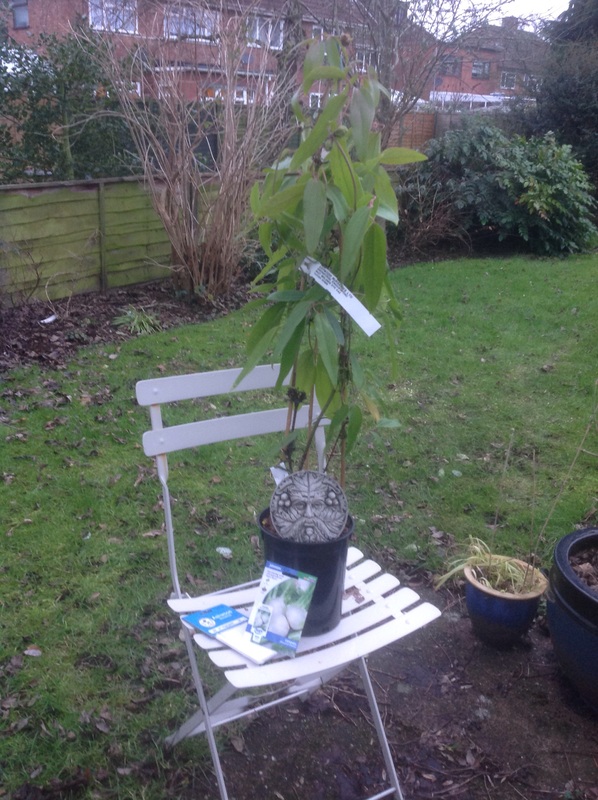 This entry was posted in Uncategorized and tagged Clematis armandii, Hellebore, Pittosporum tobira on January 6, 2016 by thelonggardenpath. Oh, dear! Here I go again, apologising for my lateness! I’m blaming an unexpected heavy workload, but I’ve made sure it has not stopped me enjoying my garden, and all its perfume. And of course, there’s the unmissable Chelsea! I made sure I made time for that! So now it’s time to show you my highlights for May. I make no apologies for starting with an old, well covered favourite, Coronilla citrina. 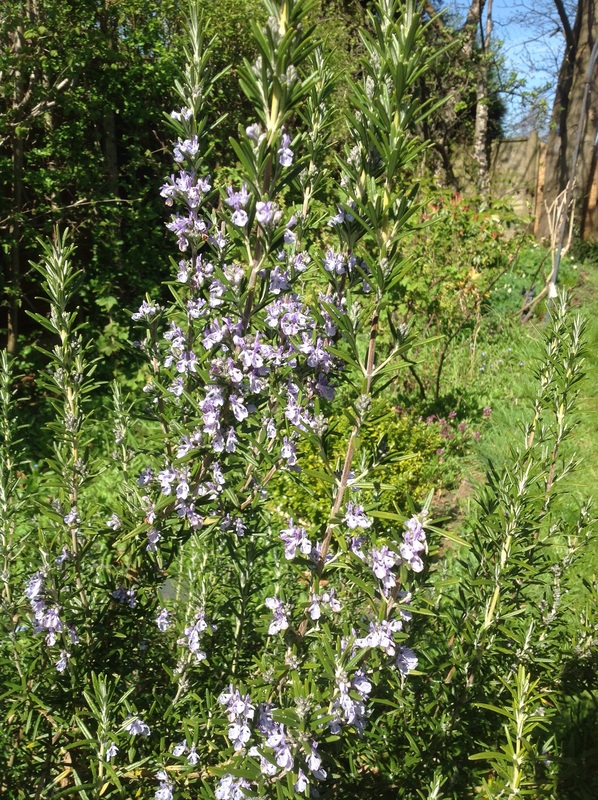 This started flowering last November, and it’s gone from strength to strength, now flowering better then ever! It’s lovely perfume still pervades the front garden. 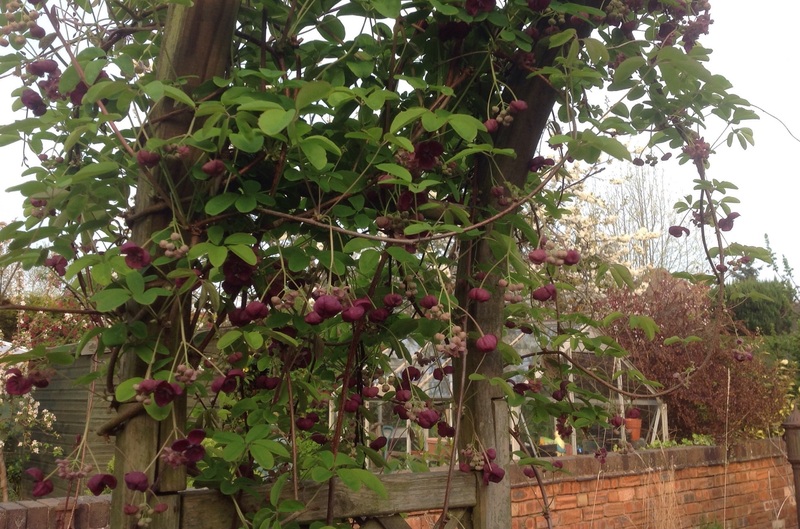 Our Akebia quinata, which started blooming last month, has gone on to make a marvellous, chocolatey display in both colour and scent. I do believe it’s the best it’s ever been! 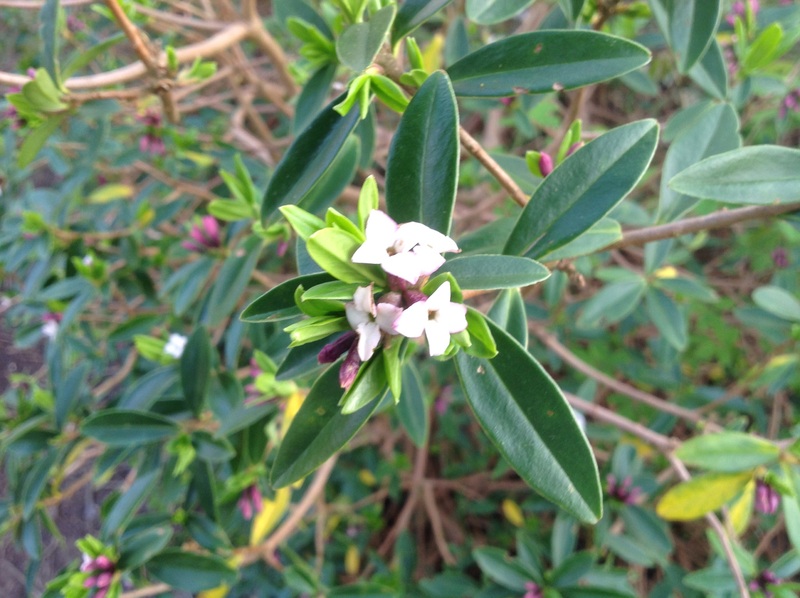 We have it growing in the Scented Shrub border as well, where it roams to its heart content, reaching dizzy, unattainable heights, but our second plant over the pergola is much more accessible for the nose! Thankfully! 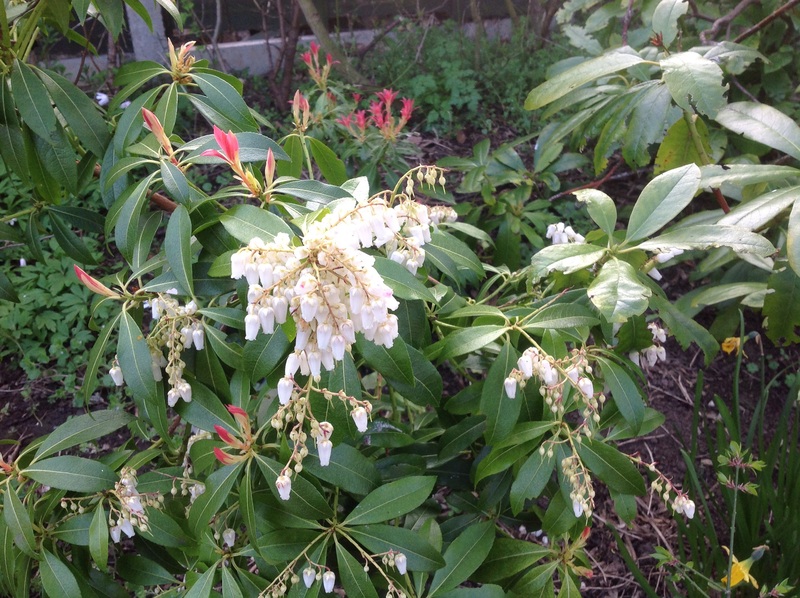 The Scented Shrub Border has other delights to show. 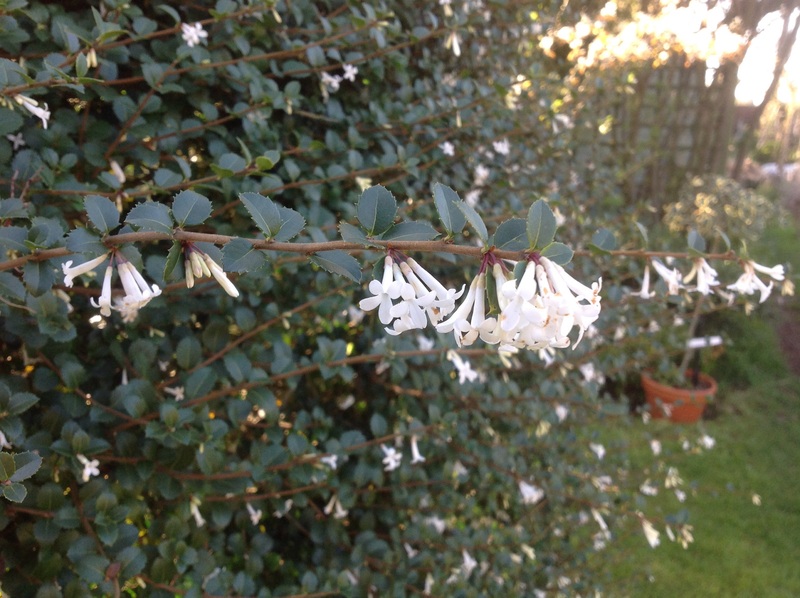 Abelia mosanensis is quite an unassuming plant, with tiny pinky-white trumpet flowers, that smell of clove pinks. It’s just starting to show its flowers now. 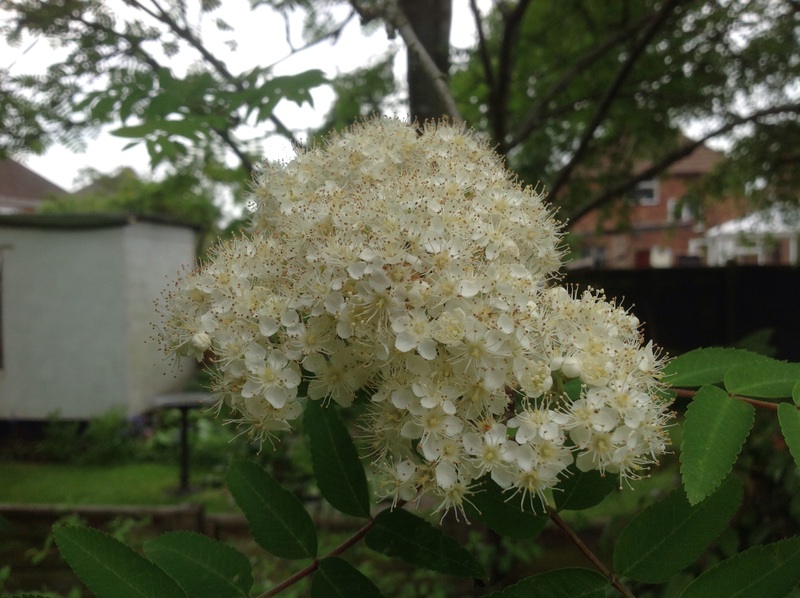 Our unknown Rowan tree, already there when we arrived, is not out of place in the Scented Shrub border, by virtue of its huge, creamy white flower heads, not unlike elderflower, but smelling of hawthorn. You might love the smell, you might not! 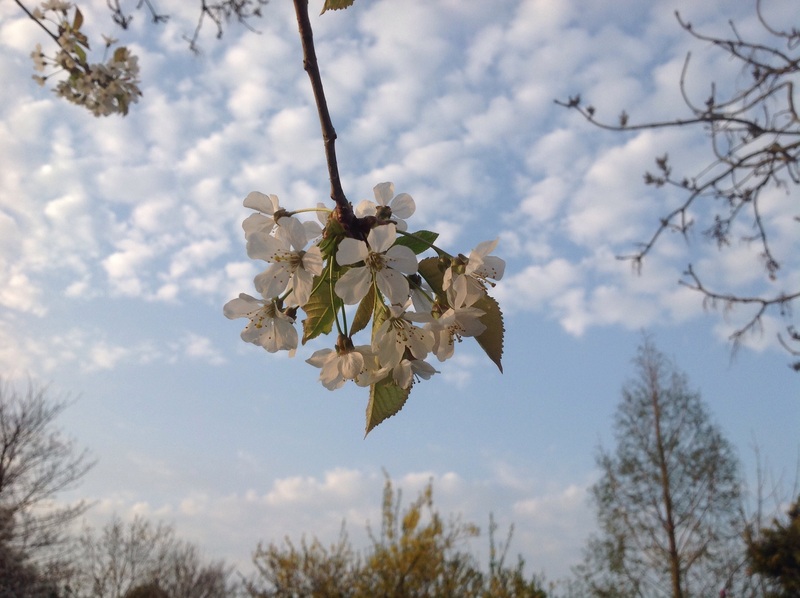 I love it – to me it’s the perfume of May! 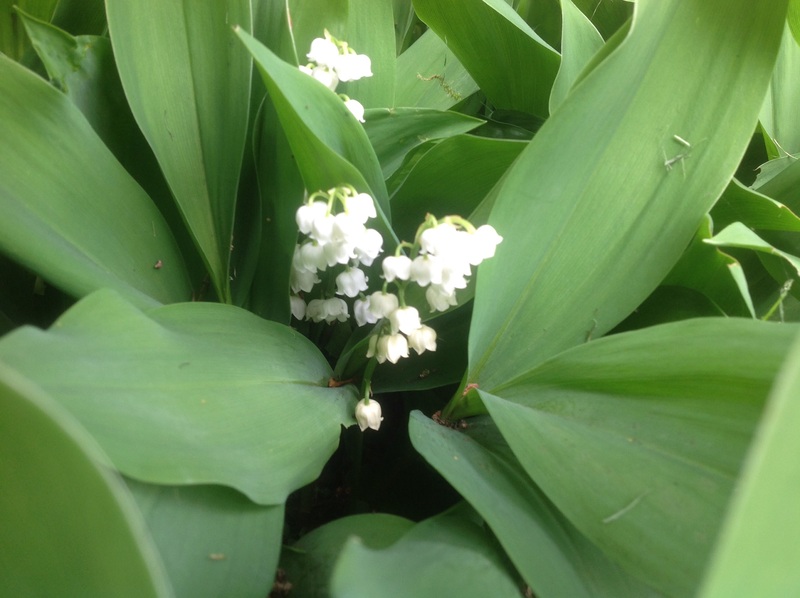 What better under planting to the Scented Shrub border than Lily-of-the-valley. 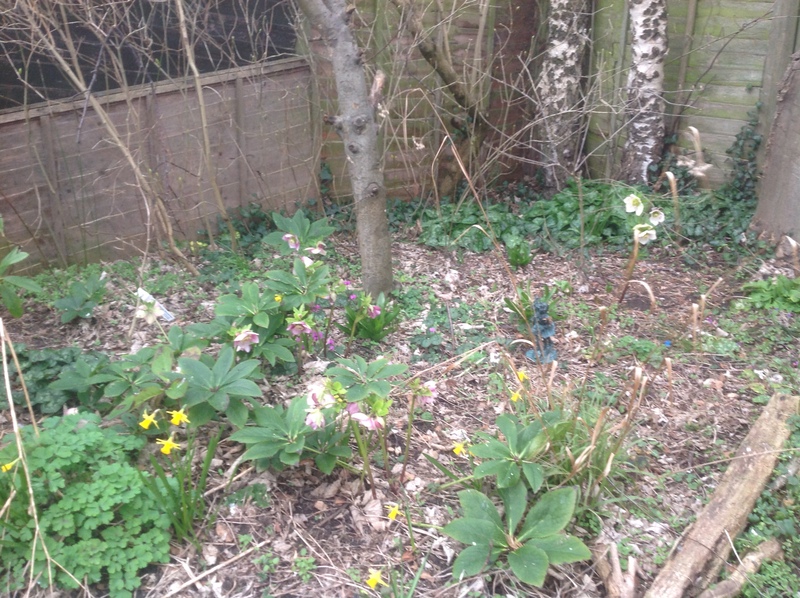 It’s really doing well in the bottom corner, carpeting the ground under the Rose and Amelanchier. I don’t need to describe its perfume to you, I’m sure. 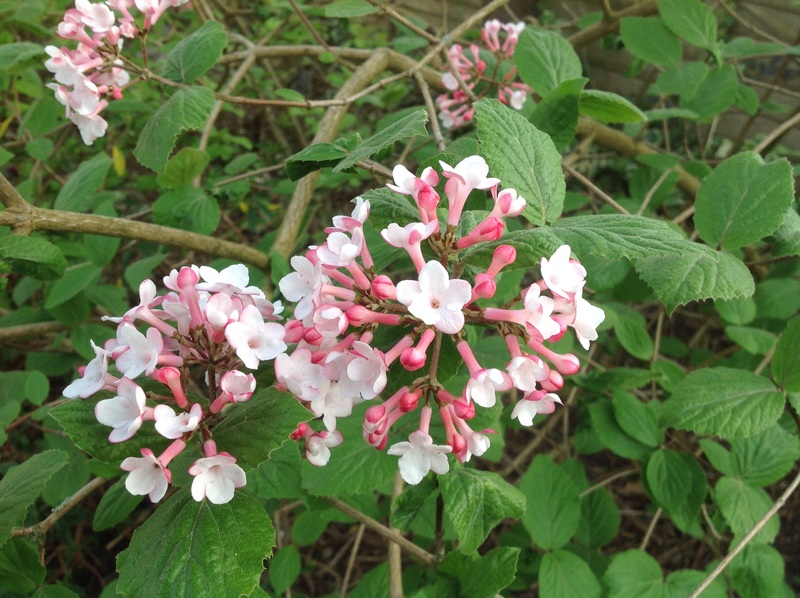 The scented shrubs are not confined to their own border. That’s just not big enough. They creep in elsewhere, too. 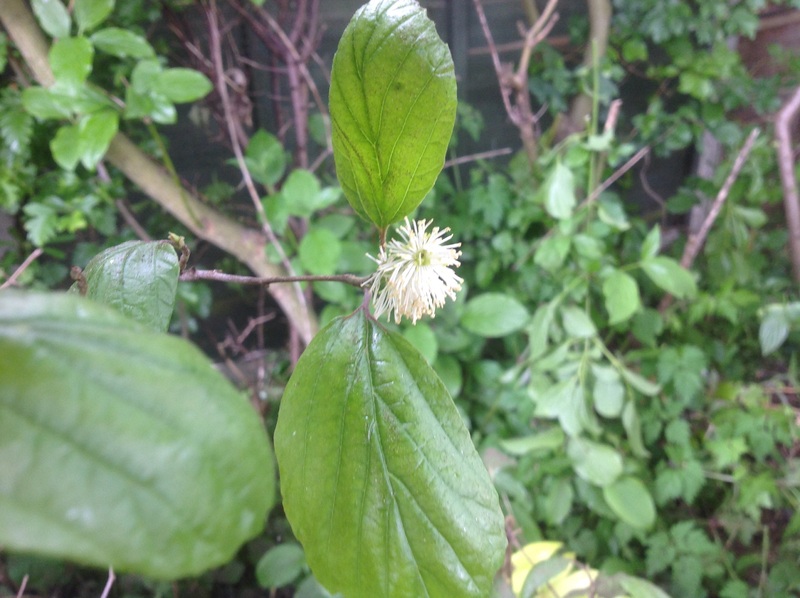 In the Woodland garden, Fothergilla major is bravely showing its white bottlebrush flowers. Sadly, it’s still struggling from its recent move, and is in need of some TLC! Last month’s Clematis armandii has put on some new growth, which has already resulted in some new flowers, albeit smaller, less showy and, sadly, less scented! 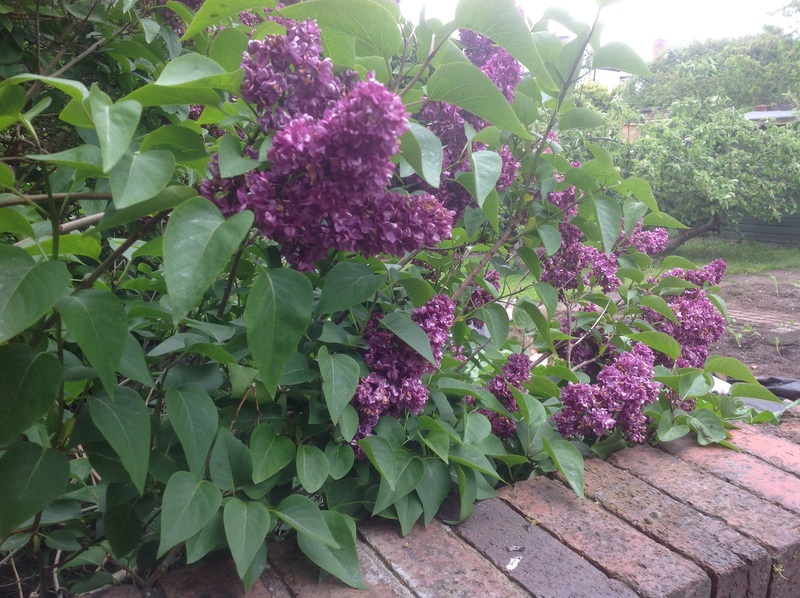 Our cherished lilac display is somewhat disappointing this year. The white one in our front hedge has been over zealously pruned (not by myself, I hasten to add) resulting in a solitary bloom, while our lilac Lilac(! 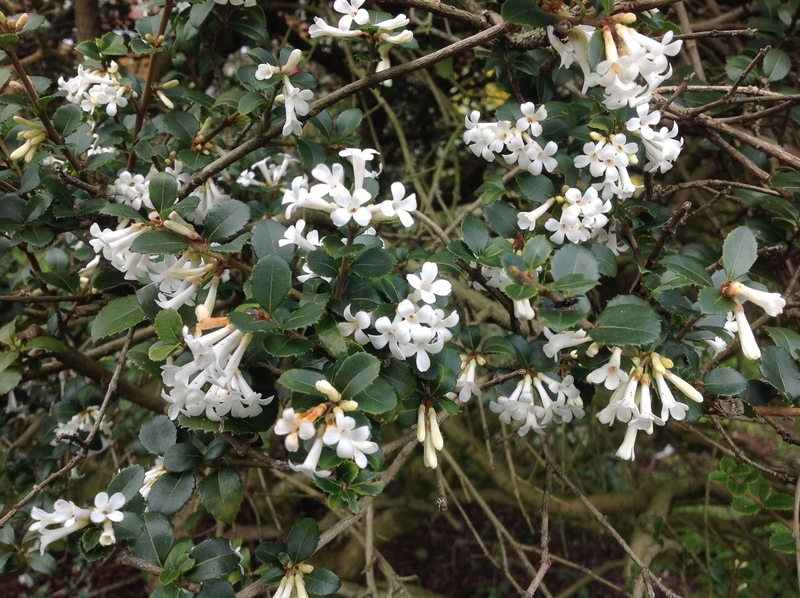 ), in the Woodland garden is flowering its socks off – in the neighbours’ gardens! 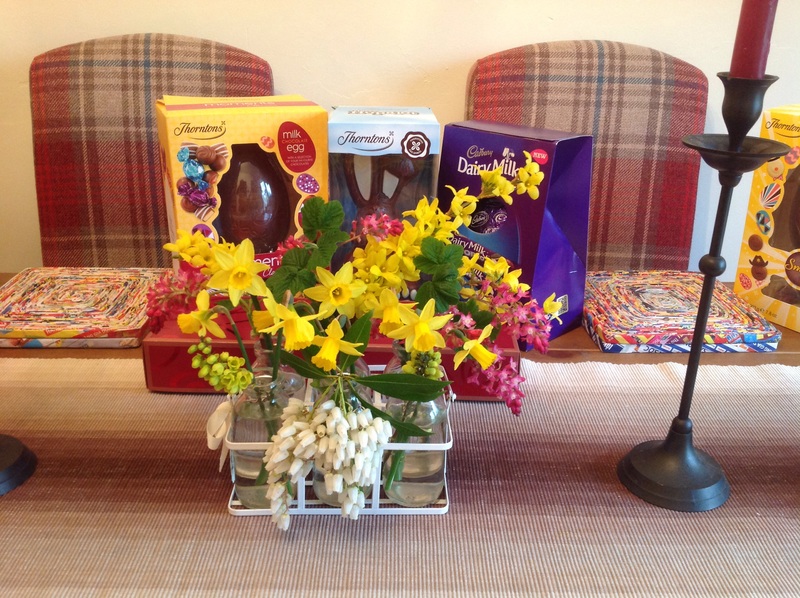 I’m having to make do with stolen pleasures, which have also been depleted this year. 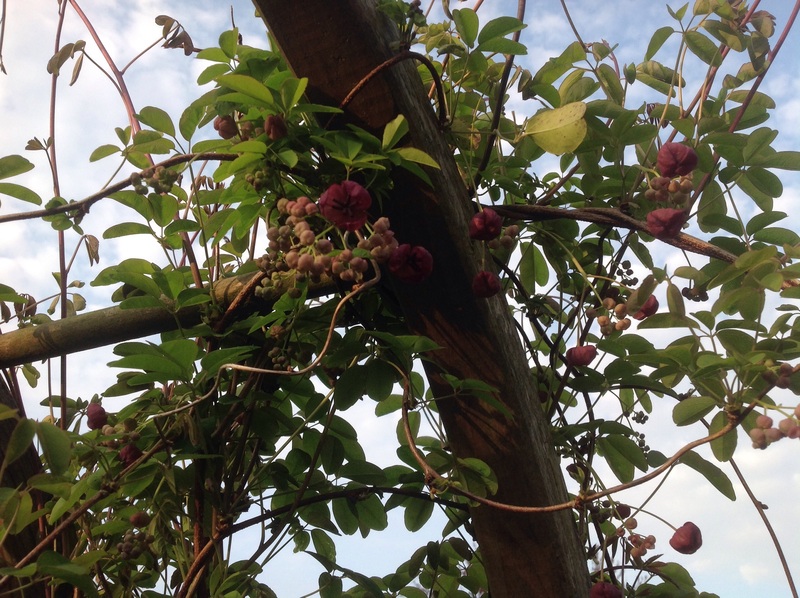 The overhanging branches, which gave us so much pleasure – and vases – has had to be severely cut back to accommodate our new shed – and to save our heads! But it’s not all about shrubs. 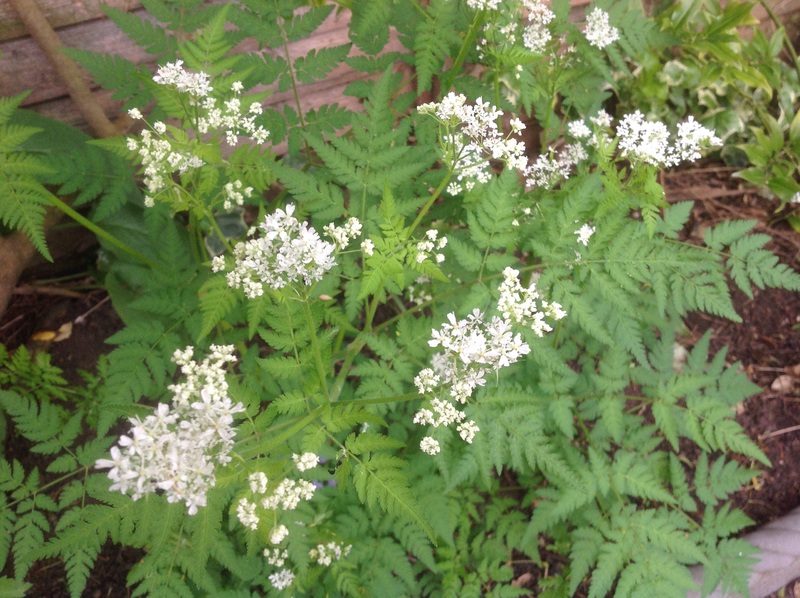 Sweet cicely looks, and smells, lovely at this time. It looks so fitting for this time of year, resembling cow parsley, with its delicate, ferny foliage and white flower umbels, with a lovely delicate perfume. 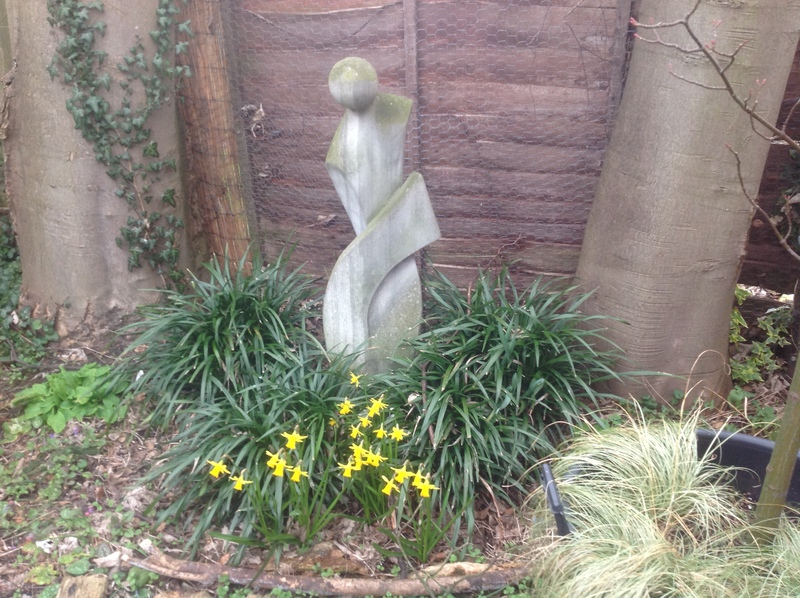 It wouldnt look out of place in a woodland or wild flower setting, but we grow it as part of our shadier herb garden. Its stalks can be used as a sweetener – good with rhubarb. And it’s the start of the Bearded Iris season! So many of them have wonderful perfume from their magnificent blooms. 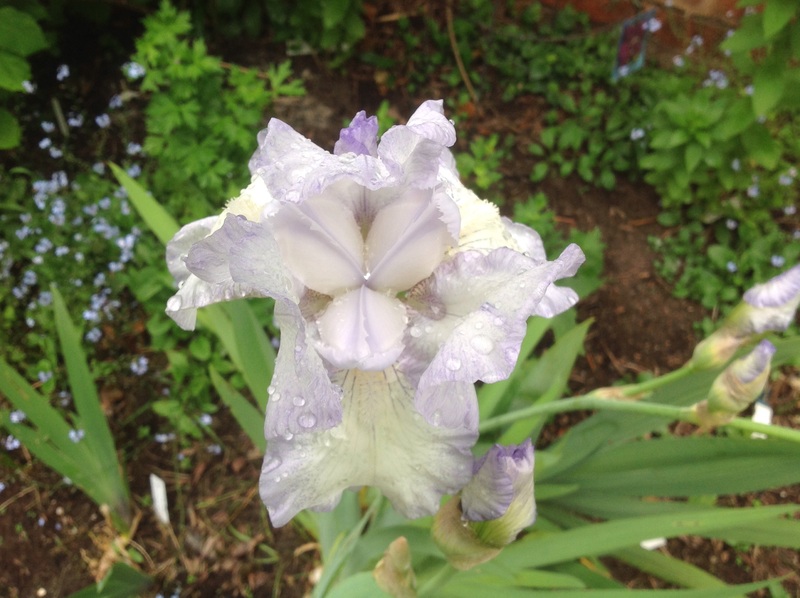 This is my rogue Iris from last year. The nursery claimed it may be “Immorality”, but I’m not convinced. Anyway, it’s beautiful and with a lovely powdery perfume. And that’s just the start! So many more buds to come, and not just the irises. Can’t wait till next month! The whole garden just smells overwhelmingly of hawthorn. Where from, I do not know! Our native hedge and that of our neighbours have no sign of hawthorn flowers. It must be our Rowan tree! And thank you, Wellywoman and Backlane notebook for coming up with the idea! 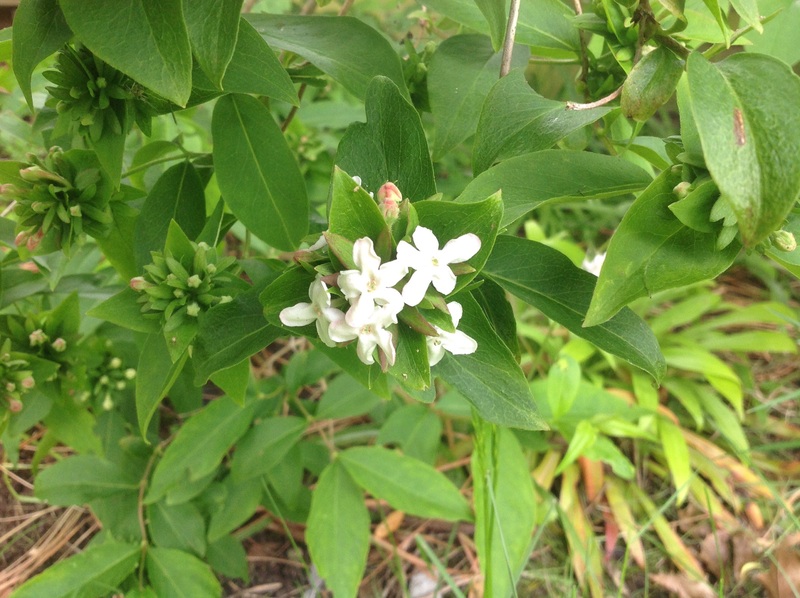 This entry was posted in The Scented Path and tagged abelia, Akebia quinata, Clematis armandii, Coronilla, Garden scent, Iris, Lilac, Lily of the valley, Rowan, Scented shrubs, Sweet cicely on May 26, 2015 by thelonggardenpath. I went to Ashwood and…. 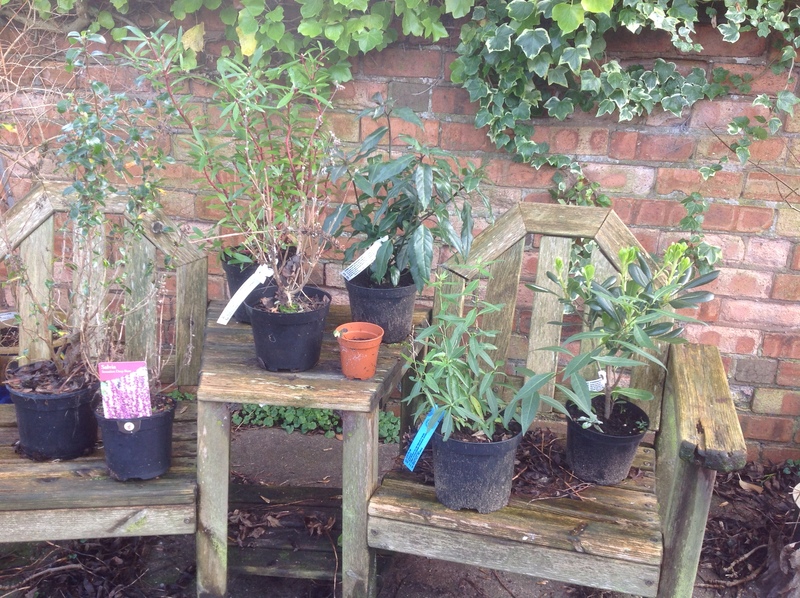 ….and spent some of our garden vouchers. Ashwood, as would be expected at this time of year, was awash with the most gorgeous Hellebores. So many beautiful colours! I was particularly taken with a deep red one, with lovely marbled leaves – sorely tempted! (Sorry! Didn’t notice its name! Will pay more attention next time!) Several Witch Hazels were also available – “Pallida” in particular, caught my eye, or, more correctly, my nostrils. It was a lovely pale lemon, and it seemed to have the best scent of those on sale. Sorely tempted again! 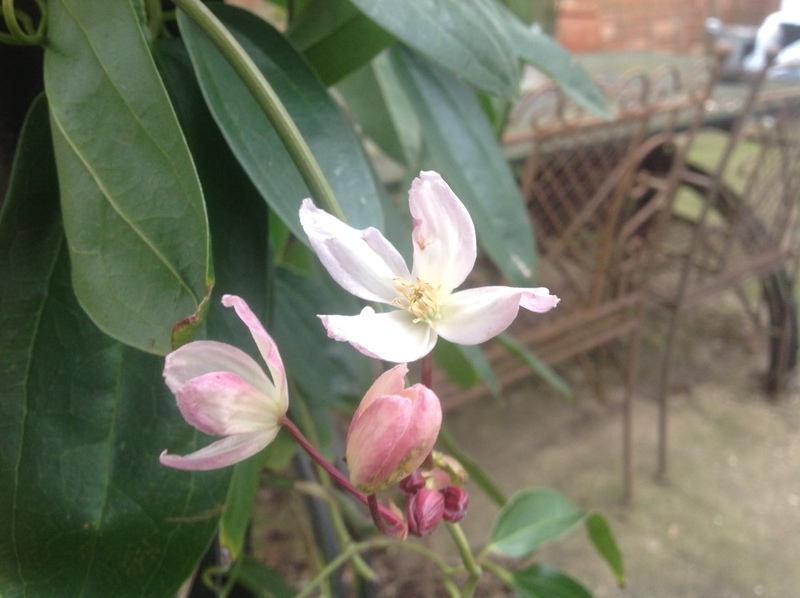 But I came away with a clematis – Clematis armandii “Apple Blossom”. Thank you, to my work friends! My choice was decided by space available. One of the uprights of the pergola has been bare for a couple of years, awaiting its replacement. Needs must! But I still have vouchers available for a Hamamelis which I’m determined to have. I just need to find a spot. And for that gorgeous red Hellebore! Mr. Chef also spent some of his vouchers. He spotted a lovely little Green Man wall plaque, to add to our collection. A packet of seeds made up the balance. He is planning to try some Florence Fennel in the allotment. Sounds tasty! Plant tags were needed, too, for all the propagation I’m planning. Many changes, moves and divisions are on the cards and I hate waste! I can’t wait to get back to Ashwood soon. I’ve left behind so many goodies! 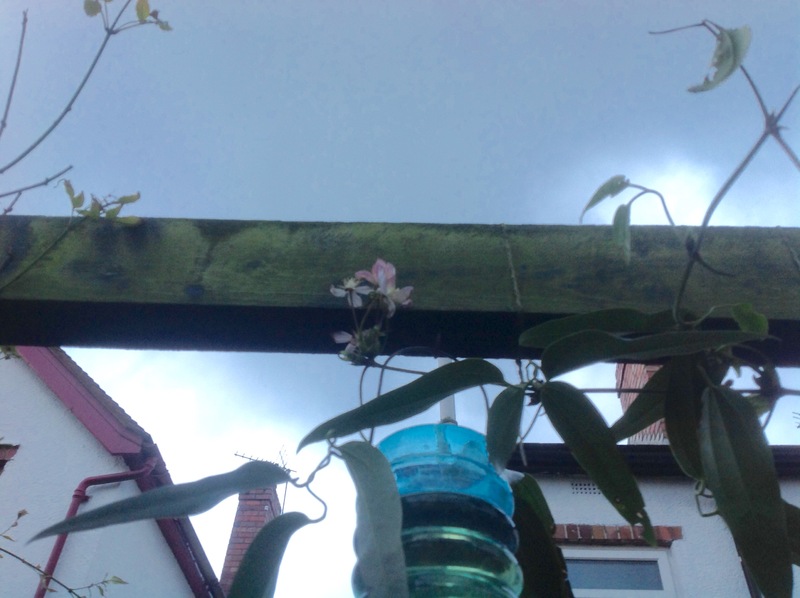 This entry was posted in I went to Ashwood and... and tagged Clematis armandii, Florence fennel, Green man on January 25, 2015 by thelonggardenpath.